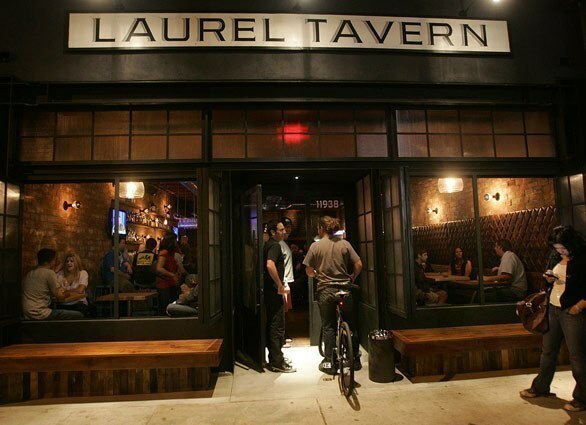 Laurel Tavern in Studio City is a great place to go for happy hour and drinks. This charming, rustic, and always packed tavern is on Ventura Blvd. in the heart of Studio City, next to a bunch of bars and restaurants. I’ve been hearing about their menu for a while, and wanted to go for some food and drinks with some friends. I went around 8:30pm, and the place was packed. We actually had to wait outside before even being let in because the place was over capacity and there was no room. When we were let inside, my friends and I ordered a couple of glasses of Dr. L 2009 Riesling white wine, (which is my favorite wine by the way- fruity, light, and smooth), and we waited for a table. The place was so loud and crammed, but once we got a table it was great. Ok, about the food. The CHORIZO SLIDERS are amazing! I swear I was in heaven. It had SO much flavor, and tasted even better than the regular Laurel Burger (which is also very good). The chorizo was charred outside and juicy inside. Pork just has so much flavor, and I had never tried a pork chorizo burger, so I was definitely pleasantly surprised. Highly recommended if you eat pork! 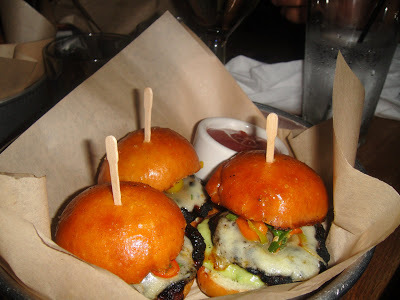 We also ordered their famous Laurel Burger which is also very good, but the chorizo sliders were to die for. They have a couple different burgers there such as the Hickory Burger, and Bleu Cheese & Bacon Burger, which are all supposed to be very good as well. We also ordered the Peppered Steak Fries. They are handcut, homemade steak fries coated lightly in hot pork fat and seasoned with black pepper & sea salt with a side of “secret” hickory sauce but what really tasted like ketchup with a sweet kick to it lol. The fries were OK. I love steak fries, but I actually wasn’t crazy about these. They weren’t bad by any means, just expected a little more flavor. Laurel Tavern has a great, eclectic menu. Next time I go I would love to try their Grilled Artichoke, Pork Belly Sandwich, and Chorizo Fondue, but I also have to get the Chorizo Sliders again lol. They also have an extensive selection of unique microbrews such as an apricot brew, a blueberry ale and so many more beers on tap. I will definitely return to Laurel Tavern soon!